Veselin Tasev credo is maximum DJ mix. Favourite styles are trance (Uplifting). Member of DMC Bulgaria. Winner of the national DJ contest (1993) for best mixing DJ and Best South-East European Trance DJ at SEE-Me Festival 2010. He is an artist of the world’s most famous label Armada Music, Black Hole Recordings and his own label TCD Recordings. 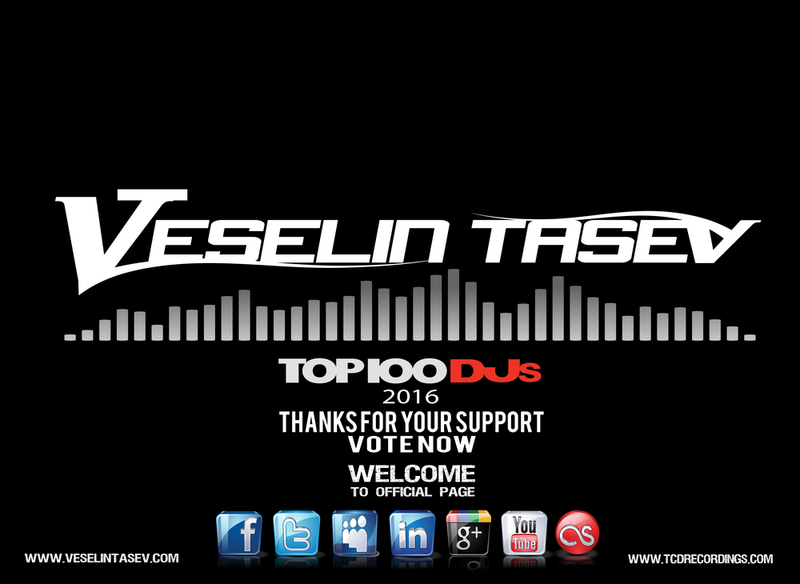 Veselin Tasev TOP 10 Veselin Tasev Playlist of the month: Veselin Tasev a trance dj , born in 1970 in Bulgaria. Has a mater degree in Psychology. Still a schoolboy when starts his DJ career in 1988. Strongly attracted to mixes and turntables "Technics sl1210mkII" from where comes the idea for his artistic pseudonym – maximum DJ mix. Veselin Tasev is a Bulgarian DJ and producer. He is the most productive name on the Bulgarian trance scene and his productions have brought him success in Europe and the United States. He is an artist of the world’s most famous label Armada Music, Black Hole Recordings and his own label TCD Recordings. In the early 90’s, Veselin Tasev started working with Steve O - producer of the music company "JOE" – Sofia, which has contracts with music labels such as Hitland-Italy; Time-Italy; Dancework-Italy; ZYX-Germany; Media Records-UK and others. From 1992 to 2001, Tasev produced several CD compilations of music hits for major international companies, including MTel - Bulgarian mobile operator. His mix productions go beyond 500.000 copies. Veselin Tasev can be defined as Uplifting Trance DJ and working also with styles as Tech House, Progressive House, Progressive Trance, and Tech Trance. Veselin Tasev has two radio shows "Trance Culture" and… "Digital Trance World " is the show that gives him the greatest popularity as a Trance DJ, broadcasted exclusive on Afterhours.fm. He is a Resident DJ for more than 10 radio stations: Afterhours.FM-Canada | Party107-USA | TDP Radio-Belgium | Pulse Radio-Australia | Puresound.FM-Russia | GlobalBeats.FM-Germany | 1 Mix Radio-UK | Sense.FM-USA | Discover Trance Radio-UK | Hi-Tec-Holland and others. In May 2007 Veselin Tasev founded the first Bulgarian Trance label - TCD Recordings. In 2007, 2008, 2009, 2010 he takes part in the biggest DJ show of the year "End Of Year Countdown", broadcasted on the number one Trance and Proggressive radio Afterhours.FM which is attended by over 300 Trance DJs of the world's elite such as Armin van Buuren, John O Callaghan, Sander van Doorn, Manuel Le Saux, Aly & Fila, Sean Tyas, Daniel Kandi, Markus Schulz, Super8 & Tab, DJ Shah, Ronski Speed, Kyau & Albert, Blank & Jones, Marcus Schossow, Cosmic Gate and many more. He was personally approved by DJ No1 in the world for 2005 and 2006, Paul van Dyk, to support his gig in Sofia, part of World Tour 2009. He played along with a lot of famous DJs like Paul van Dyk, Markus Schulz, Ronski Speed, Cosmic Gate, Sander van Dorn, Menno de Jong, Pedro del Mar, Fast Distance, Cor Fijneman, Stoneface & Terminal and others. Veselin Tasev’s tracks are supported by: Ferry Corsten, Markus Schulz, Sean Tyas, Aly & Fila, Adam Nickey, Fast Distance, Tom Colontonio, Ronski Speed, Roger Shah, Pedro del Mar, Suzy Solar, Manuel Le Saux, Jorn van Deynhoven, Philippe El Sisi, Claudia Cazacu, Ehren Stowers, Reorder and others. In February 2010, his newest single"Pacific Waves" was included in the CD compilation "LAS VEGAS 10", presented by Markus Schulz (Armada Music). In April 2010, "Pacific Waves" was included in the CD compilation "Global DJ Broadcast Top 15" (Armada Music) In February 14th 2011, released newest single “Desire” by TCD Recordings and was included in the CD compilation “MELOMANIA 20” (Black Hole Reocrdings) presented by Pedro Del Mar.